Well, spring sprang and then it boinged back into autumn again I think. Shucks. After a couple of days of blazing sunshine I’m now sat in my living room staring out the window at a rain soaked street and grey skies again. Boo, hiss, bah humbug and other sulking noises. Ah well, maybe things will improve soon. In the meantime I’m going to keep my hopes up. We’re planning on spending a week in a caravan over the summer hols and perhaps thinking about preparations for that will cheer me up a little? Both kids spent most of last year wearing jeans, jumpers, thick (odd) socks, raincoats, wellies and warm clothing. Perhaps this year will be different? With that in mind I’ve been browsing K & Co and their spring and summer offerings. Maybe I’ll do a bit of home shopping and get them kitted out. 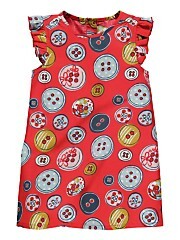 Maybe I’ll even be able to persuade Darlek to wear a dress! If I could persuade her to wear one, I think this would be it. Darlek is a bit of a tom-boy so frills and flounces aren’t her thing at all. I think this might suit her, I love the bright colours and the striking design. I can picture us all sat around a lit BBQ on a balmy summer’s evening, swatting midges and soaking up the evening sun. Darlek nearly always wears trainers, but if she was wearing this, she’d need sandals. 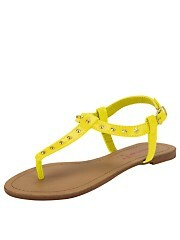 Soooo…..
They’re called yellow ‘Lolly Stud’ girls sandals. I’d prefer to call them ‘Buttercup Sparkly’s’. But that’s because I’m a closet hippy. That outfit, including the sandals, would cost us £28 ( I think…my maths is terrible) which is actually not that bad. I have to admit I’ve never shopped with this company before, but after a quick browse of their pages I am actually tempted. And now for Sausage’s summer kit. He’s never really shown an interest in clothes so this should be easy. Darlek has a mind of her own and will happily point blank refuse to wear anything she dislikes, but her brother is a lot easier going when it comes to fashion. Which isn’t a surprise really, he is only 5 and prefers to spend his time thinking about Star Wars and what’s for tea. His cousin makes me laugh, he’s 6 and has already started combining long and short sleeved T’shirts so they colour co-ordinate and loves to wear shirts that show off T’shirts underneath. I’m afraid my son seems to be following in my footsteps, we wear the first thing that falls out of the cupboard in the morning. Anyway *puts serious face on*. Fashion. Boys. Erm… Right if i could find the perfect smart, casual summer outfit for my lad I think I’d go for this ensemble. Practical eh? He would ADORE this. 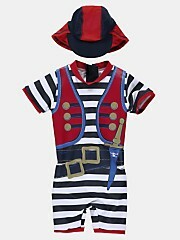 £18 and you could have your very own pirate child too! As for footwear: if we were at the caravan there would be lots of grass around and he would probably take off his shoes and run around in his socks so they’d be pointless. Either that or he’d pretend to have a wooden leg, hop around, lose one shoe forever in the long grass and I’d get annoyed. So, barefoot or socked feet it is. Hope there’s not many nettles around this year. BRING ON THE SUNSHINE, THE BBQ’S, THE SUNCREAM, THE ICE-CREAMS, THE SHORTS, THE DRESSES, THE erm…PIRATE OUTFITS! Come on May, don’t fail us now. We’ve had a hint of what summer could be like over the last few days and we want more! This is a collaborative post with K&Co, although all meanderings and piratey comments are my own. Piratey is a real word, I know that because I just typed it. ‘Why? ?’ As a mum, this one word is one I deal with every single solitary day, over and over and over and over again. ‘Why is the sky blue?’ ‘Why do I have to wear my underpants this way round?’ ‘Why should I eat with my fork, my fingers work better?’ ‘Why doesn’t the moon fall down?’ etc etc. This is the topic of a meme Wendy from Inside the Wendy House tagged me with. The aim is to include questions that WE want answers to. So here are my ‘Whys?’ Any answers will be appreciated. In fact I demand answers, just like the kids do, it’s my turn to be a nuisance. Please tell me…..
1) Why can’t I walk in heels without staggering around looking like I’m drunk. Was I born without balance? Am I allergic to pointy, smart shoes? 2) Why do I read approximately five books at a time on average, stack and topple them next to my bed, lose them constantly, forget the page I’m up to, have to re-read them and retrieve them from the kids’ bedrooms after Sausage has used them as ammunition whilst arguing with his sister. Why don’t I just buy a Kindle, drop it in the bath and save time and effort. 3) Why can’t I stop staring at the bathroom, hoping it’ll one day clean itself as if by magic. It’s never going to happen is it? 4) Why do I become obsessed with random projects that have absolutely nothing to do with real, practical every day life. Penguins. Say no more. 5) Why do I write detailed lists, ignore the most important points and then lose them when I’m bored of looking at them. Accidentally on purpose of course…..
6) Why do I read cookbooks on the loo? It’s probably just not nice. 7) Why do my jeans always end up with holes in the left knee. Do I have a sharp knee? Will the lady at the charity shop ever pluck up enough courage to ask me that? 8) Why can’t I eat just one biscuit, instead of the whole packet plus a packet of crisps and a Snickers. 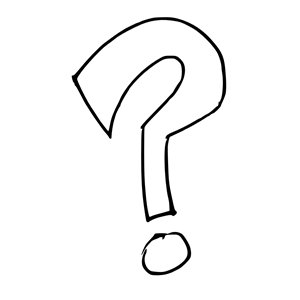 1) Post your whys – as many or as few as you like. 2) Link your post to Mummy Central, and it would be great if you could leave a comment too. 3) Tag 5 bloggers to keep this going. 4) If you’re not a blogger, leave your whys as a comment below! I’d love to read them! 5) Show your support by reading a few others and commenting on them. I’m tagging Tracy at WhiteLilyGreen, (although she’s v busy with a beautiful new baby so if she doesn’t have time, no worries!) Dragons and Fairy Dust Mummy Drinks Tea, Elaine from Fun-as-a-Gran and Older Single Mum! Gotcher! Here we go again! I was given this title and asked to write for 15 minutes. This one is a bit rambling. Does anyone else care to share about their favourite pair of boots / shoes / heels? Might be interesting to read other’s shoe related memories maybe? My unforgettable pair of shoes were my huge black doc martens that I wore when I was 16 going on 17. They were part of my slightly hippy chick era and I used to wear them with leggings an awful lot. My mum said they made my legs look like golf clubs but I chose to ignore her and wore and loved them anyway. I even made my own shoe laces with a system of coloured threads and weaving, I thought they looked fabulous. Some people painted their Docs, I never had enough confidence to actually go that far, I simply customised the laces – which is probably quite a good half way house between ‘Way out man!’ and ‘I’m not shouting too loudly cos if I do, I’ll look stupid’. I wish I still had them, they were comfy as cushions on my feet and were waterproof and went with anything, or at least I thought they went with everything. My long taselled patterned hippy skirt looked great with them (I think…..). Mind you, when you’re young, I think it’s possible to carry almost anything off. Now I’m getting all wistful and feeling like an old git, which I am, a little I suppose. One thing I remember very fondly about my Docs was that they hurt my feet like hell at first, but my dad quite literally sat in front of the tv massaging the leather with some sort of grease or other until the leather softened up enough so that they didn’t give me massive blisters. Very thoughtful, and they did fit like a glove after that. I trekked many a mile in those shoes, to friend’s houses, up and over windswept hills – in particular on a walk when a whole bunch of us stayed up all night and climbed a hill on the longest day of the year to watch the sunrise. I remember seeing the mist lying like a sea between the higher ground bumps. Mum once said that mist like that looks like sleeping ghosts. I love that imagery. I suspect the boots probably cracked over time, I was never very good at keeping up with polishing them, I’m still rubbish at shoe maintainance. They were great though, a little bit of rebellion against the very straight style I was brought up with. One day I’ll get another pair, and then I might actually paint flowers all over them, and make funny coloured laces again. I think I’m old enough to be undignified and not worry about it so much this time round. Hell! I might even dye my hair with pink streaks, like I always wanted to but never dared. I think I might like being old and mad after all. The self conscious years of trying to look trendy (or purposefully none-trendy) are long gone, but the old yearning for these funniosity boots still remains. The next one was really difficult for me. I usually write with my own voice, or a more serious version of myself if I’m required to write something that isn’t actually tongue in cheek. This task had me writing in the style of…. Your narrator is an old man, benevolent and wise. He is not omnipresent (i.e. he can’t tell you what is in your character’s head), but sits at a distance and gives the reader a sense of feelings, etc., through physical description. He is watching tourists in a café. Write as your narrator. It was really, really difficult and I don’t know how well it comes across really, at least I tried! I have edited very slightly. The couple lean over to kiss each other, so sweet. She is about 18 I think, although it’s hard to tell these days. I should think the boy is a similar age, he has that fresh faced innocent look that erodes away with time. I should know! I look in the mirror now and the wrinkles make me look ever so tired. I’d rather not look like that, but they are the lines of my years, like the rings on a tree. Discreetly I sip my tea, stare at the open paper on the table in front of me, blankly – it’s not very interesting, some Hollywood woman has worn an odd dress apparently. Probably thinks she’s being new, fresh and interesting. I say she’s a new dog playing old tricks. The rain patters on the window and the drops shiver in little tracks top to bottom. The other person in the cafe looks troubled, I don’t like peering at him for fear of attracting the wrong sort of attention. He keeps scrabbling in his bag for something that doesn’t appear to be there, no matter how many times he looks. His phone rings a lot too, but he doesn’t answer it. Very annoying in a relaxed place such as this. I’d tell him to switch it off, but he’s a middle aged, stressed looking bloke and I think he’s got enough on his plate already – a fried breakfast in fact. He’s not eating it though. Odd that. My eyes drift back towards the rainy street, watching the world fly by in a rush in the blink of an eye, everything passes so quickly. My tea is going cold, I cup my hands around the base and the warmth seeps through my fingertips.